It can be challenging for older people to get into and out of bed as it requires flexibility and stretch. We have eight bedroom safety tips. Avoid bedspreads, bed linens and draperies that reach the floor in order to keep feet from getting tangled. Before getting out of bed look at the floor and make sure pillows or blankets have not fallen down onto your walking path. Before getting out of bed, sit on the edge of the bed with both feet flat on the floor. Take a minute to make sure you’re not experiencing any dizziness and your balance is good before standing. Make sure the bed is the appropriate height. Beds that are too high or too low can cause you to fall. The Disability Rights Education and Defense Fund recommends beds should be 20 to 23 inches high from the floor to the top of the mattress. Place a sturdy chair in the bedroom to sit on while getting dressed. Keep clutter in the bedroom to a minimum and never leave laundry baskets, shopping bags or boxes on the floor in your walking path. Wear supportive slippers that have non-skid or rubber soles whenever you are walking. Remove throw rugs or use carpet tape to secure the edges to keep the rugs from slipping, buckling or turning up at the corners. Illuminate their walkway with nightlights, and have one in the bathroom as well. 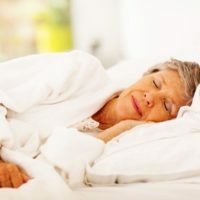 Those are practical ways to encourage mom or dad to be safer when getting out of bed, and as their caregiver, you may need to see that the bed linens, chairs, any electrical cords, are not a hazard to them. Bed levers –There are various styles available. They can be fitted to the bed, wall, or floor. This allows them to raise and lower in and out of bed with support. These are also known as bed rails, grab handles, grab rails or support rails. Leg lifters –These devices help a person who cannot lift their legs onto the bed. There are manual devices, such as a leg loop, a reinforced strap that hooks around an individual leg to enable the person to lift it up onto the bed. For those people who lack the strength or balance to do this, there are a number of power-assisted devices on the market. LifeFone knows you want your loved one to be safe when you aren’t around, and these practical tips can help you be re-assured of their safety. Should your loved one fall while getting in or out of bed, a medical alert device is advised. These wearable devices, either a wristband or necklace, can help you or your loved one get fast help when needed most.